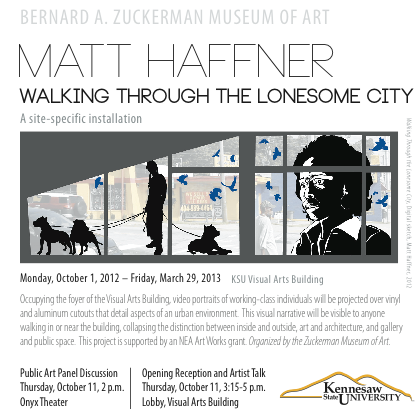 The Kennesaw State University Bernard A. Zuckerman Museum of Art presents “Walking Through the Lonesome City,” a site-specific installation by Assistant Professor, Matt Haffner, and funded by an NEA Art Works grant awarded to the museum earlier this year. The exhibition will occupy the foyer of the Visual Arts Building from October 1, 2012 through March 29, 2013. Haffner’s installation will feature video portraits of working-class individuals projected over vinyl and aluminum cutouts that detail aspects of an urban environment. Described as a “timely, fictional, post-apocalyptic visual narrative,” it blends graffiti, photography, film and installation. It will be visible to anyone walking in or near the building, collapsing the distinction between inside and outside, art and architecture, and gallery and public space. The NEA awarded grants this year totaling more than $24 million to support the creation of art that meets the highest standards of excellence, public engagement with diverse and excellent art, lifelong learning in the arts and the strengthening of communities through the arts. The installation is also a featured event of the city-wide Atlanta Celebrates Photography 2012 Photo Festival. The exhibition will also feature a Public Art Panel Discussion on Thursday, October 11 at 2 p.m. in the Onyx Theater followed by an Opening Reception and Artist Talk from 3:15-5 p.m. in the Lobby of the Visual Arts Building. Meg Aubrey "Damaged" oil on canvas 40"x60"
Join us at whitespace on Thursday, October 11 at 6:30 pm for an artist’s talk with Meg Aubrey. 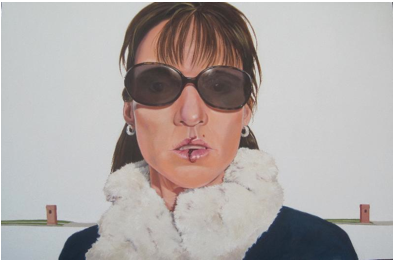 She will discuss her current exhibition at whitespace, Domiciled, which explores the darker side of suburbia and the psyche of the women who inhabit it. All communities have specific boundaries and restrictions, but few are as stifling as those of suburbia where conformity is king. Aubrey subverts the American dream, revealing to us the individual’s reaction to and resulting behavior in this new, barren realm. She has received some excellent press lately, including a review by Jerry Cullum in ArtsATL and a review by Felicia Feaster for the Atlanta Journal and Constitution. Make sure you listen to her interview on AM 1690 with Burnaway too. This is also one of the last opportunities to see Domiciled before it closes Saturday, October 13, 2012. This entry was posted in Uncategorized on October 11, 2012 by Whitespace.